There’s a common thread among many of the big tech trends today. Big Data, the Internet of Things (IoT), machine learning, Artificial Intelligence (AI) are all powered by one thing: data. Better access and analysis of data enables people and organizations to be nimble and make better decisions faster. It’s pretty simple. Unfortunately what’s not simple is how you access, share, safeguard and understand that data. Manufacturers, in particular, benefit from and, therefore, must protect their most valuable asset: IP. So the ability to easily share this data throughout the enterprise as well as with outside partners, and yet also simultaneously safeguard this valuable data, is often paramount to success. What makes access to this data and the high-level visibility it provides is the fact that it’s often buried within its departments, databases and systems. Even though these various data silos meet the requirements of their intended purpose, and benefit those individual departments, they are often disconnected from each other and fail to provide any potential enterprise-wide benefits. PDM systems, for example, work well at securing and storing IP within product data and ensuring proper version control is maintained. There are other areas of the enterprise, however, that could also benefit from this information. Supply chain management—sourcing, procurement, and inventory management—and manufacturing planning—budgeting, scheduling, and quality assurance—are functions that stand to benefit from the use of product design data housed within PDM systems. Likewise, users of ERP systems that manage financial transactions and personnel information would benefit from PDM and MRP connections. Unfortunately linking these data silos often requires expensive customization, additional development and ongoing, costly administration and management. What has been missing is a means for managing access to and distribution of this valuable data, including product data, in a format that’s useful to others outside of engineering and throughout the enterprise. Breaking down these traditional data silos, SOLIDWORKS Distributed Data Management (DDM) solutions, which include SOLIDWORKS PDM and the newly introduced SOLIDWORKS Manage, tap and present the underlying data in specific silos in formats that make it easier for other enterprise-wide applications to utilize it. 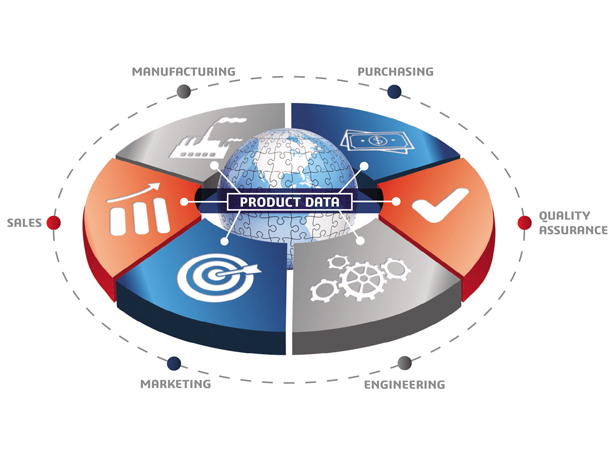 DDM distributes data to internal and external users by providing access to the most up-to-date information, leveraging PDM data beyond product development, enabling manufacturers to accelerate and support other critical applications that can leverage product data. While PDM is a critical tool for effectively managing product data, using this data to facilitate other important functions such as project management, process management, items management as well as the ability to generate reports with easy-to-understand dashboards takes that data one step forward, enabling organizations to leveraging its value outside of their design department. Let’s touch briefly on each of these areas to see how SOLIDWORKS Manage, a SOLIDWORKS DDM solution, can help you leverage your data throughout your company to make better, more informed decisions. With SOLIDWORKS Manage, and its tight integration into SOLIDWORKS PDM, organizations can now plan each stage of a project, assign resources and tasks, and attach required engineering documentation within the same ecosystem used in design. Resources can be allocated to each stage of a project and tasks can be defined and assigned to project stakeholders. Attachments can be added to a task, including CAD files, documents and items with no file associated with them. When users complete their work, the project progress is automatically updated. With SOLIDWORKS Manage, you have complete visibility into all projects, enabling organizations to plan, manage resources, connect project deliverables and monitor status right down to the task. Data management systems have electronic workflow capabilities that are mainly focused on document approval and engineering changes, but many manufacturers may have more complex needs for engineering change requests, orders, and notices. With the powerful process management capabilities in SOLIDWORKS Manage, you can automate critical workflows to minimize errors and streamline approvals. Individual processes are stored as a record and authorized participants have access to information associated with this process. Effected items, documents, and CAD files can be attached to the process and tasks can be automatically created. Insight into the progress can be viewed visually, so you know exactly where you are in the process. In today’s digital environment, it’s easier than ever to create vast amounts of data, but keeping track of it all can be a challenge. To gain insight into all of this data, SOLIDWORKS Manage provides fully customizable Dashboards to visualize critical information in an easy-to-consume format for better decision-making. Dashboards are fully customizable and can be built using grids, gauges, charts, and more to capture key information about what is happening in your department or business. These graphical elements reference your data, in real time, and provide instant access to key performance indicators. PDM is a great tool for keeping track of CAD files and creating an engineering Bill of Material (BOM), but not everything gets modeled in CAD and typically, there are items that need to be added after the design is modeled. Items such as glue, spare parts, packaging and documentation need to be accounted for, as well as overall quantities when customers order multiple units. With the tight integration of SOLIDWORKS Manage and SOLIDWORKS PDM, all of this data is in one place, whether represented by a CAD model, document, or database-only items. Others in the organization can create a BOM in SOLIDWORKS Manage and leverage the engineering BOM by referencing the SOLIDWORKS assembly. This can be the basis for creating a manufacturing BOM, which can contain additional files, records or items that are necessary to manufacture a product. Learn more about SOLIDWORKS DDM solutions by downloading “New Methods of Maximizing the Value of Data throughout the Enterprise” white paper. Or, if you’d like to take a deeper dive, watch Mark “Model Mania” Schneider explain all the functionality offered in SOLIDWORKS Manage in the video below.